Autumn, I love you. I love your starting-to-be-chilly air, the reds and golds, the letting go, the apples off the tree, the smell of cinnamon suddenly appealing again, the memories of summer starting to fade. And I love love love that you, autumn, bring us school returning again. When I was a kid, and when I was a teacher, I mourned the end of summer. I liked school. I liked teaching school. However, the transition between long indolent days of doing whatever I wanted and the early-morning schedule and days locked into routine seemed pretty rude. September seemed like a mournful song, sung out of tune. Summer stinks when you’re a parent who works for herself. The gauzy sunlight photographs of friends’ vacations I saw online only made me less happy that I was on the computer in 85-degree weather. Of course, I wasn’t allowed to sit at the computer for longer than 12 uninterrupted moments before small hands reached for my legs, climbed up into my lap, and tried to type on the keyboard. That’s what I like least about the long summer vacation now. I want to throw it all away, have a two-month vacation from work like I did when I was a teacher, and spend that time skipping stones on the beach with the kids. Unfortunately, bills don’t go on a two-month vacation. Danny and I worked in fits and starts this summer. Now, with school in session, Lucy goes bounding into school singing and comes out skipping. She seems to love school as much as I did when I was in the first grade. Desmond now goes to a lovely daycare three days a week, where he has friends and teachers who adore him. He’s talking up a storm and starting to tell his own stories. That is what autumn reminds me: it is good to miss the people you love, a little. You have so many stories to share when you come together again. Meanwhile, Danny and I turn to look at each other at 9:20 in the morning in amazement. We now have the next six hours together to work, write, cook, hold meetings, and make decisions without once being interrupted. People. Six hours. Finally, I feel like we are settling into routine again. And the best part of this routine of autumn? After six hours of working and thinking, chipping away at it all, I feel like I’ve done a good day’s work. (This fascinates me: Sweden is moving to a standardized six-hour work day, since it’s a more realistic expectation of what one can accomplish in a day.) I close up the laptop, give Danny another hug, and go out to greet Lucy at the bus. Today she ran off it and right into my arms, babbling happily. Work is done. Family life begins again. I’m spending more focused time with the kids now that they are in school than I could all summer. Tonight, we had a family dance party to Pharell’s Happy video. After the first time we played it, Lu requested, immediately, “AGAIN.” Desmond shook his shoulders side to side, grabbed my hand, and demanded we all dance in a circle together. And then we shared a piece of apple cake together. 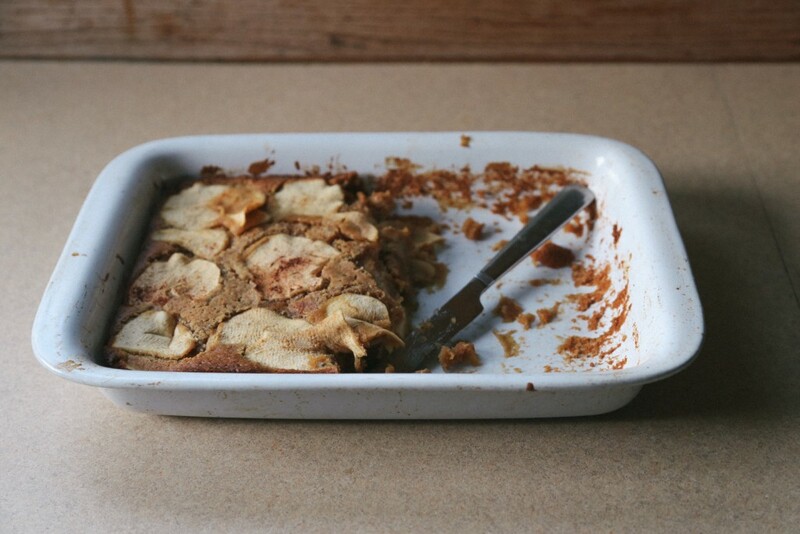 This honeyed gluten-free apple cake comes to us from Rachel, who wrote to Danny and me this summer, asking for advice on a recipe for her wedding cake. I’m glad I could answer that email — so many had to go unanswered — because she sent us a gluten-free adaptation of her mother’s apple cake recipe. She told us that her mother “…tried many times to make it gluten-free to no avail.” It wasn’t until Rachel and her fiancé made the cake with our gluten-free flour blend that they made the cake they wanted. Sadly, Rachel’s mother died last year. Rachel kindly gave us this recipe to share with you. 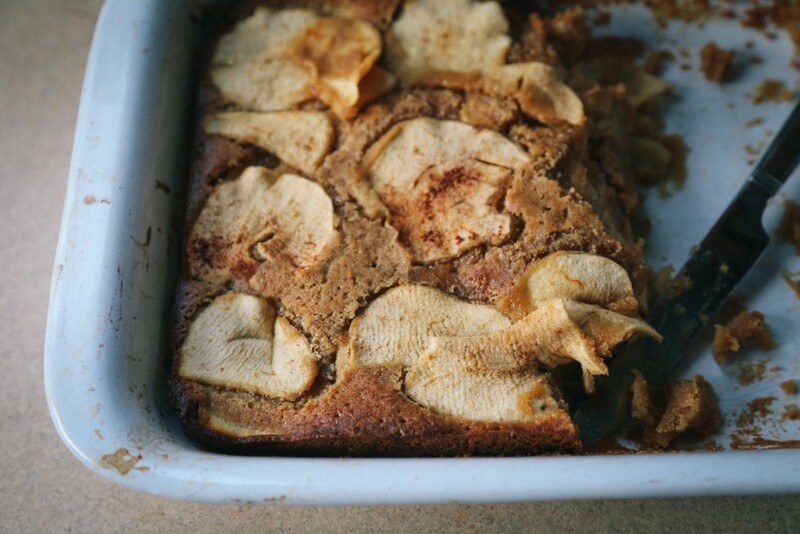 This is a simple, homey cake, almost as much apples as cakes. This moist, dense cake will never be in a food magazine. It is truly made made to feed people. We changed the recipe just a bit. We tossed the apples in honey and cinnamon instead of sugar, since honey is a humectant and helps to make the cake moist. We love the caramel dark sweetness of coconut sugar far more than bleached white sugar. We used half coconut oil and half canola oil, since the taste of coconut sugar and coconut oil together can make the coconut taste in this cake a bit overpowering. And we like the apple slices on the bottom layer of the cake and the top, so the softened apples spill out of every slice. You can play with all of this and still make a great autumnal snacking cake for yourself. Prepare to bake. Grease a 9×13″ baking pan. Drizzle the honey over the apples, then sprinkle them with cinnamon. Toss to coat the apples with honey and cinnamon. Set the apples aside. Combine the dry ingredients. Whisk together the flour, baking powder, and salt in a small bowl. Set aside. Make the batter. In the bowl of a stand mixer, whisk together the eggs and sugar at medium speed. When they are well-combined, add half the flour to the batter. Combine the two oils together then slowly drizzle them into the batter along the side of the bowl, with the mixer running. Add the rest of the flour. When no visible flour remains, turn off the mixer. Bake the cake. Bake the cake until the edges are starting to pull away from the pan, the cake feels set, and a toothpick inserted into the cake comes out clean, about 45 minutes. (You’re going to hit apple slices, so do the toothpick carefully.) Let the cake cool in the pan for 15 minutes before serving. Feel like playing? If you can’t find coconut sugar easily, try 1/2 brown sugar and 1/2 white sugar. If you love the coconut taste, use all coconut oil. If you want a cake with an apple taste but not so many visible apples, cut the apples into large dices instead of slices.